A garage floor mat is one way you can maintain the cleanliness of your garage or shop so you don’t spend money refinishing the flooring. Garages and shops are bound to have spills, leaks, and corrosion from vehicles. However, you can avoid permanent damage to the flooring when you use a garage mat for protection. There is no assembly required or difficult instructions to follow. You can move your mat easily due to its light weight. This means you can use it in multiple locations. The garage floor mat is available in three sizes: 7.5′ x 19.5′, 7.5′ x 18′, and 7.5′ x 16′. The design of the mat is patented and is made from a vinyl coated polyester weave that is U.V. coated to give the material protection from the sun. The color of our Krauss Surface Saver mat is green. The gauge of the mat is 22 oz. per square yard. Our garage mat is also a great way to keep your driveway looking clean. Your home is your investment, and unsightly stains on your driveway will take away from the appearance of your house. Our garage floor mat lets you park your vehicle over top of it so that leaks are contained in one place on the mat. This allows for easy cleanup of your driveway. The mat is easy to maintain by cleaning it with a broom, mop, shop vac, or water hose. Our Krauss Surface Saver mat will last for many years to come. It has been tested over and over again since 1996 under a variety of conditions. The six month warranty on workmanship assures you that the mat is manufactured with our guarantee to excellence. This garage floor mat is all you need to keep your garage or shop flooring looking like new. We pride ourselves on customer care and service. Contact us directly by phone, email, or fax to place your order or with any questions you may have about our Krauss Surface Saver mat. 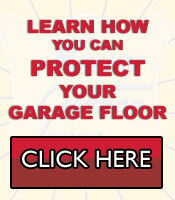 Make your first garage floor mat a Krauss Surface Saver. Why waste your time and money on garage mats that don't last?